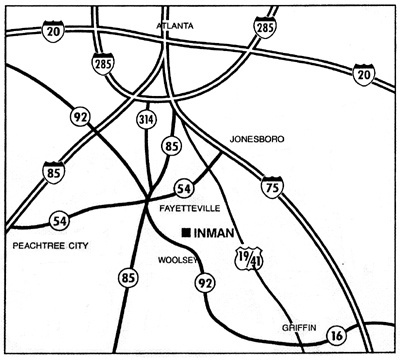 We are located about five miles south of Fayetteville, off Georgia Highway 92 South on Hill’s Bridge Road. This is about 13 miles north of Griffin and 25 miles south of Atlanta. To reach our farm from Atlanta, exit I-75 south at the Ga. 85 (Riverdale) exit. This is not to be confused with Interstate 85, which won’t get you here without a lot of difficulty. Travel south on Ga. 85 through Riverdale and Fayetteville. About a mile south of the old courthouse in Fayetteville, you’ll see Ga. 92, which is a left-hand turn just across from a Chick-fil-A. The signs point you toward Griffin. Go south on 92 for about five miles. Hill’s Bridge Road is on the left across from an old country store called Inman Country Store. We’re three-quarters of a mile down Hill’s Bridge. Our farm begins where the pavement ends. The drive for our the shows is on the left. The tree farm entrance is on the right. From Griffin, take Ga. 92 north to Hill’s Bridge and go right on Hill’s Bridge.